Which was even more exciting than i had assumed it’d be. Hours of non-stop music and what a venue too, the barn is so inviting and the sound is perfect, a great home to this event! My favorite moments were when Levon was singing! The Organiks and Donald Fagen were the special guests. Fagen did King Harvest, it was great! At the Bearsville Theater. WOW, just WOW. the show was called " Beyond the Beehive" she read from her book over a great slide show interspersed with live performances with her band. My favorite was her doing Johnny Thunders’ "You can’t put your arms around a memory". I’ll never forget it. love that song!! FILM #3. A couple of amazing youtubes. One of Sister Rosetta Tharpe singing a couple of tunes, "Didn’t it Rain" and "Trouble in Mind" at a train station in the UK on a blues and gospel caravan in 1964. The audience was literally on one side of the tracks and Sister Rosetta was on the other with her band. She rode in on a horse drawn carriage with a big fur coat and heels. Her electric guitar playing is so fantastic and wild and her voice and rhythm are stupendous!! She is one of the very, very, best performers ever!! The other film footage i love on youtube is one of Howlin’ Wolf doing "How Many More Years". Lots of great close-ups on his face. His voice range is to die for, so expressive and powerful and you know what else…funny! I think it’s Son hHouse over on stage left at the bar and he’s getting way into it. Howlin’ is sitting down but that doesn’t stop him from having the most infectious moves from his chair. I could hardly wait for this release! C.W. ‘s from Australia. These songs are about taking a journey he didn’t mean to take and ending up on a ship to Africa, then hunting a talking tiger and going to jail. He reminds me of Joseph Spence. Made up of members of the Tinmen, the New Orleans Jazz Vipers and other great groups. Most notable: Washboard Chaz! Good old tunes like "Moan you moaners" and "When i grow too old to dream". His combining of poetry and song is A #1, no one is better. This third edition of the festival turned abit riotous but Leonard tamed them. Poor Kris Kristofferson didn’t fare as well. Live at the Black Swan Pub in Tivoli, NY. Almost as wonderful as it was with Mark Sandman…and that is BIG! Go and see em! The real deal! Honky Tonk at its BEST. Lucky’s great uncle is Ernest and it shows! 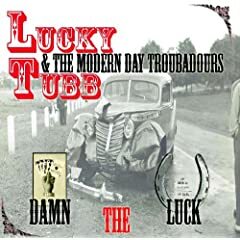 His just out record, "Damn the Luck", is one for the jukebox! Old school country music with all its feathers! Starring: Sauerkraut Seth (guit & vox), Jim Krewson (bass & vox), Kiki Dufault (guit & vox), Melissa Dufault (vox), Lukas Shwartz (fiddle), Pete Adams (steel guit), and Rick Leab (drums, aka the box). Put together by Jeffrey Levy-Hinte from hours of footage from the 1974 three day concert in Kinshasa, Zaire. The music that was to go along with the Ali vs. Forman fight. You may have caught a tiny glimpse of some of this in another great Film about the fight called When We Were Kings. There are amazing performances as well as pre-show and post-show happenings. James Brown, Celia Cruz, Johnny Pacheco, Miriam Makeba, Bill Withers, the SPINNERS (who shine extra brightly! ), Tabu Ley Rochereau, Franco with OK Jazz, Hugh Masekela and, of course, many great moments with Muhammed Ali!! Oxford American – The Southern magazine of good writing. Their 11th annual southern music issue. True Soul and other true sounds: 2CDs carrying 50 unstoppably GREAT tunes. Peter Aaron turned me onto this mag and I am still VERY grateful. this is the stuff. check it out, subscribe, its totally cool. Terry Riley at the Fisher Center. Dylan’s Theme Time Radio… have some on CD now and man do they satisfy. thanks BOB! Richard Manuel and Rick Danko live at O’ tooles in Scranton PA in 1985. I heart Richard! Be the first to comment on "Raissa St. Pierre Poop 09"